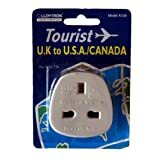 You may also like to consider a worldwide travel adaptor or a voltage converter / transformer. The electrical sockets used in Micronesia are type A and type B. These are 2 variants of the same socket - one grounded (with an earth pin) and the other ungrounded. You will therefore need a UK 3 pin to type A/B adaptor in order to plug in your appliances. Voltage - The mains voltage in Micronesia is 120 V which is incompatible with most UK appliances (UK voltage is currently specified as 230 V +10% / - 6%). Check any appliances that you wish to use carefully to see what voltage is specified. Items such as laptops will often specify "100 - 240V" either on the equipment or the power supply (if it has one). If not then you will need a transformer to operate your appliance. Frequency - The frequency in Micronesia is 60 Hz which is slightly higher than in the UK (which operates at 50 Hz). In practical terms this makes little difference as most travel appliances will run at either frequency. Some items with motors, such as hairdryers and some clocks will run a little faster than intended but it is not likely to be problematic. Check your device - it may say 50/60 Hz which indicates that it is compatible with either frequency. If you are in doubt or have expensive equipment check with the manufacturer first as some equipment may be damaged by running on an incorrect frequency.